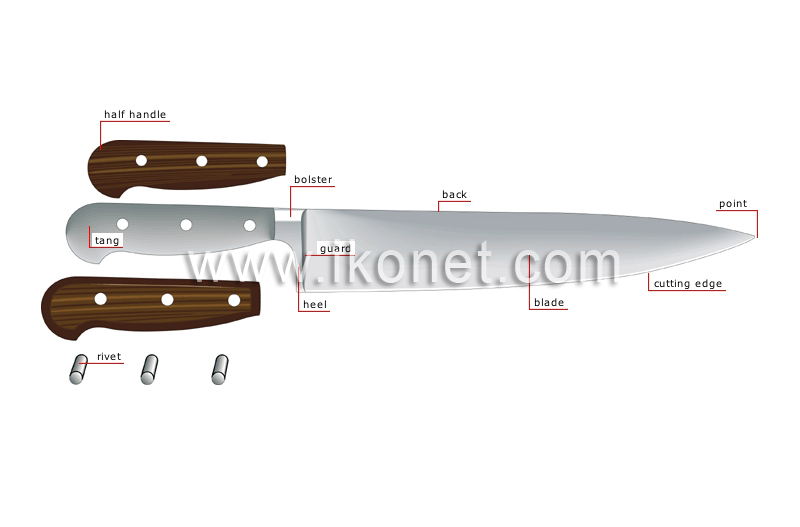 Kitchen knives are used to prepare (cut, slice, bone, trim) food. Short cylindrical bolt that holds the knife handle together. Tapered part of the bolster at the bottom end of the blade. Metal part, as wide as the blade, separating the blade and the tang. Thin flat piece of metal forming the sharp part of a knife. Blunt side of the blade. Protruding part that prevents the blade from touching the surface of the table when the knife is laid flat. One of two pieces of the knife handle, on each side of the tang.